There are books that you love, and then there are books that lift you up, spin you around, and then drop you back to earth, dazzled. 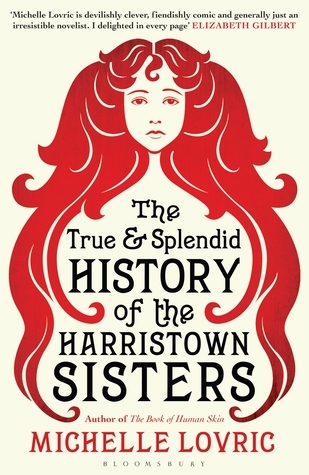 ‘The True and Splendid Adventures of the Harristown Sisters’ is one of those books; a captivating story packed full of full of characters, incidents and images. There were seven Swiney sisters, and they were all blessed with fantastic rivers of hair, cascading below their knees and ranging in color from honey gold to copper red to the deepest black. Darcy, the eldest, was dark-haired and dark-hearted; twins Berenice and Enda bickered incessantly; Oona was gentle and fair; Pertilly was plain and Stolid; Ida was the youngest, a wild fairy queen; and flame-haired middle sister, Manticory, would tell all of their stories and the stories of them all. The were all beautifully, richly and distinctively drawn, and each sister has her own role in the story that was to come. They grow up penniless, fatherless and hungry; raised on tales of their sailor father—whose unpredictable nocturnal visits are witnessed only by their mother – that they do not entirely believe. It’s no wonder, as they are all so different, and they are treated with scorn by their neighbours. Darcy is treated with particular contempt by her mortal enemy – ‘the Eileen O’Reilly’ – but she finds a way to fight back. She conceives a plan to free the girls from poverty: she bullies her sisters into creating a vaudeville show, filled with maudlin songs and hair-oriented skits, with a finale featuring the sisters simply letting down their prodigious locks in a cascade. In an age when women always wore their hair pinned up, when they only let it down at night, in the privacy of their bedrooms, Darcy thought that her show would be a sensation. It was, and it was a success beyond her wildest dreams. It doesn’t take long though, for unscrupulous men appear to manipulate the young women financially and romantically. As they rise from Harristown, to Dublin, and then to Venice, they have to deal with notoriety and scandal, and as sisters fall under different influences and pull in different directions there are consequences for them all. Can the show go on? Manticory begins to have doubts about the products they hawk, she questions Darcy’s financial management and the close control she keeps of all their purse-strings, and she wonders about the mysterious small grave in the backyard of their Harristown home …. The telling of the story is sublime, the prose is gorgeously descriptive, somehow rich, poetic and earthy all at the same time. The settings are magically evoked, they live and breathe, and so many story strands – same that are predictable and some that are anything but – are woven together to make a glorious tapestry of a book. There’s wit, there’s colour and there’s love threaded through what might otherwise have been a very dark story. And at the centre of it all are those fascinating, infuriating sisters; they quarrel bitterly, they feud, they take sides against each other, but they also cling together and keep each others secrets. Such a wonderful portrayal of sisterhood! I loved watching them all interact, and their conversations were a joy. I loved Manticory’s narration; I loved the way the story played out; I loved that there was a thread of feminism that was strained at the time but that never quite broke; I loved so many things …. This story was inspired by the true story of the ‘Seven Sutherland Sisters,’ who were once household names in America, who used their locks to sell hair products, who found fame and fortune; and who at one time owned the grandest of mansions where they lived together …. That story sounds fascinating, and really it couldn’t have inspired a finer fiction. ‘The True and Splendid Adventures of the Harristown Sisters’ more than lives up to its name; it pulled me into its world, it held me spell-bound, and I was so sorry when the story was over and I had to let go. I so want to read this book! I love the premise; and the fact that you liked it as much as you did makes me want to read it even more. 🙂 Great review. Oo this has really made me want to read this book . I enjoed The Book Of Human Skin by her which i read a few years ago. I recall thinking this sounded like an engrossing read and your review just confirms it! I read this earlier in the year and really enjoyed it. You’ve reminded me of all the things I loved about it, especially Manticory’s wonderful narration! I’m really keen to read this – your review’s just reminded me to borrow it from the library (it’s got potential for my thesis too). I happen to have a family of seven daughters as cousins – I’ll have to tell them about this book as I think they would love the idea. My library doesn’t own a copy. I will have to request that we purchase it ASAP! Oh this is going on my wishlist right now!